Download Photographer Resume CV Template PSD. This is a modern, attractive and professional looking resume template suitable for photographers, photo editors and retouchers and help you to get your dream job. This Free Resume CV Template is designed and created in adobe Photoshop and you can change the color and styling of this resume template easily according to your own requirements. 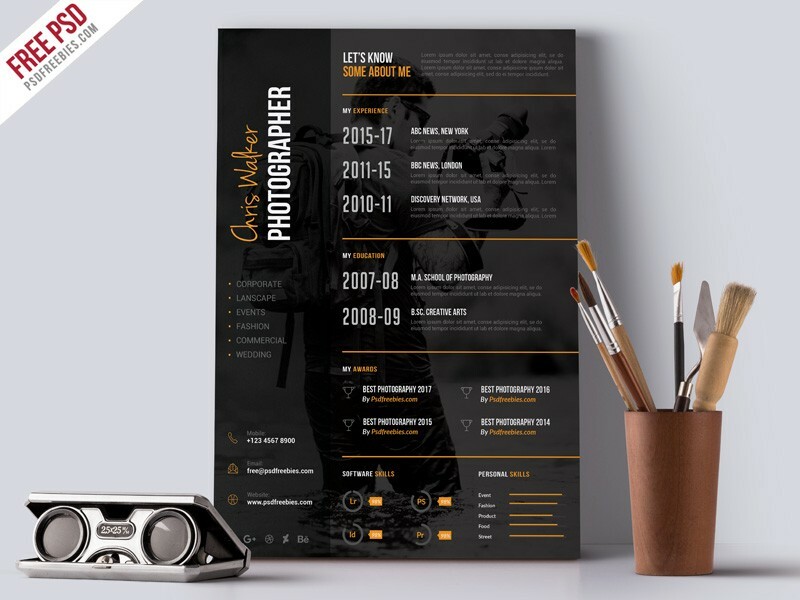 Photographer Resume Template is designed in A4 Paper Size, CMYK, 300DPI and it is a Print ready Template. It is very easy to customized, grouped in organised folders and layers are well named, so it is very easy to make the necessary change as quick as possible. Hope you like this Free Photographer Resume CV Template PSD. Enjoy!